Photo: The Gully Homestead, ca. 1871, 200 South Chambers Road, Aurora, CO. Listed on the National Register of Historic Places in 1986. Photographed by User:Jeffrey Beall (own work), 2011, [cc-by-3.0 (creativecommons.org/licenses/by/3.0)], via Wikimedia Commons, accessed April, 2013. The Arapahoe County Courthouse is located at 5334 South Prince Street, Littleton, CO 80166; phone: 303-795-4400. Arapahoe County was named for the Arapaho Indians, one of the larger tribes of plains Indians, who along with the Cheyenne occupied Arapahoe County east of the foothills running into what is now western Kansas. Arapahoe County is Colorado's first county, since almost half of the entire area now Colorado was Arapahoe County of the Kansas territory. In 1861, when Kansas was made a state, Colorado was made a territory with Arapahoe County as one of the 17 original counties. In the late 1820s, trappers searched this region for beavers to supply the great demand for men's beaver hats. In the late 1830s and 1840s, the demand shifted to buffalo skins. In 1832, the first trading post on the South Platte River was built on Cherry Creek, which was then part of Arapahoe County. In 1848, gold prospectors on their way to California stopped in Colorado long enough to pan its streams. They found gold on West Dartmouth Avenue, just west of Englewood where Dry Creek flows into the Platte River. This was the first important discovery of gold in Colorado. In the eastern portion of the County, the area was comprised mainly of sheep and cattle ranches. One of the largest ranches was owned by G.A. Snow, who came from New York and accumulated 25,000 acres of land—12,000 of which were in Arapahoe County. The same family operated the Snow Ranch for 86 years until 1957. Other big spreads were the Parrett Ranch, the Owens Ranch and the Price Ranch. 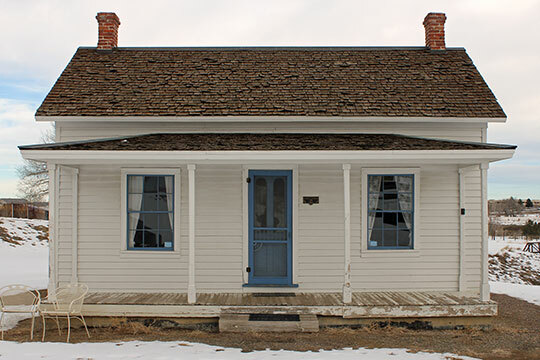 History of Arapahoe County, www.co.arapahoe.co.us, accessed March, 2012.